You are looking at the highest quality aluminum reproduction B-17 Flying Fortress Nose Art panel ever offered on eBay or anywhere else I would imagine. Hand fabricated from .032 and .050 6061 Aircraft aluminum. The panel measures 48″ wide and approximately 48″ tall, and extends 11.5″ from the wall when hung. Have your favorite artist paint your wife, girlfriend or anyone you desire on a panel worthy of display anywhere. You would have a hard time not thinking it came right off a Boeing B-17 Flying Fortress, since everything is right off the measurements of the real aircraft, right down to the 700+ rivets and spacing. Yellow bombs are just stickers to give you a feel for how they would look after your artist paints them on. There are some minor flaws in the aluminum, a few dents, scratches, but they are all there to look as close to a real B-17 panel as possible, they never even left the factory perfect, it was WWII and they were rushed out of the factory. The panel is finished to represent a well preserved panel as if it flew missions, and was left in storage the last 70+ years. 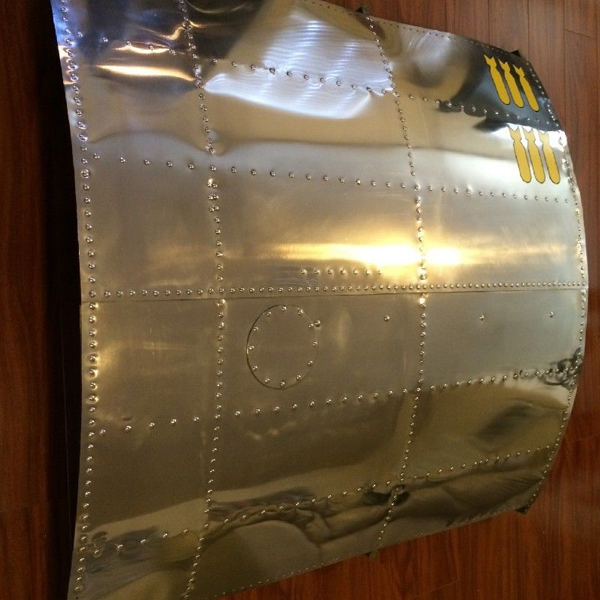 The 4 Bulkheads are hand crafted from .050 aluminum over a hand made red oak buck with lightening holes and riveted onto the panel to provide the correct shape of the fuselage. There is a radio squawk box that is not period correct, but that can be easily removed. This panel is actually the very first product from NoseArtDisplays.com and carries the serial number 001. There are plenty of other panels on eBay worthy of a Man Cave, but this one is special, one of a kind and made for a high end artist for high end display.